THEME: God gives us time to grow – no early weeding out! Our Lord didn’t do that. He had all sorts of people around him: the learned, the ignorant, the good-living, the bad-living, tax-collectors, prostitutes, the lot. What is he doing? they said. Why doesn’t he weed them out? As any gardener knows, the weeds must be left until the seedling can be clearly recognised. Even then, removing the weeds may pose an even greater threat. It might sever the seedling’s root system. Often the weed brings the seedling away with it. In the case of human beings it is an even more risky business. “Weeding-out” has no history of success, but that doesn’t seem to curb people’s passion for it. Exactly twenty years, ago in April 1994, Rwandan Hutu tribesmen tried to ‘weed out’ all Tutsis from Rwanda. In just 100 days, 1 million people were massacred – 20% of the total population. This is racism in its extreme – where one group murders another. The result: murders and atrocities on both sides and a sharply divided nation in serious need of reconciliation. Strange isn’t it that Christ never weeded out Judas? The church did not always show her master’s tolerance. Galileo could testify to that. 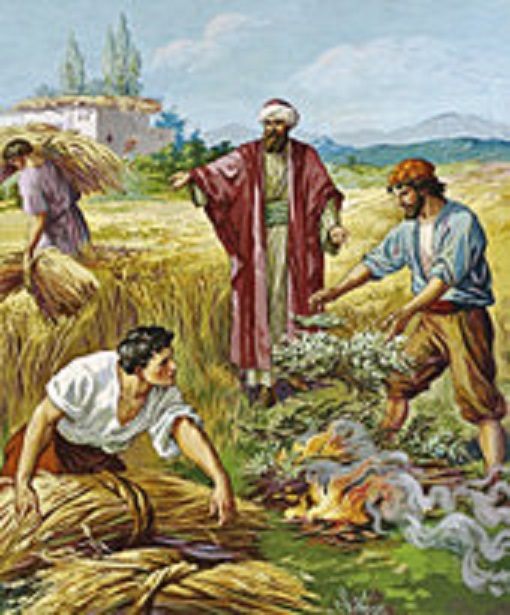 The parable of the weeds is starkly simple and yet widely ignored. And the reason is self-evident: Only God has eyes sufficiently discerning and fingers sufficiently gentle for this job. Weeding out is God’s prerogative. Life would be so much better for everybody, if we would just leave it to him. Inspirational Rwandan genocide survivor and priest, Father Emmanuel Nsengiyumva, recently completed the first leg of his nationwide tour of fourteen Australian Catholic dioceses in fifty days—deeply touching the hearts and minds of hundreds of people in Sydney, Broken Bay, Parramatta and Wollongong. He also described his deep wounds from losing two of his brothers, and witnessing so many atrocities during the genocide, but how he was able to heal through the love of God and now dedicates his life to helping others to do the same. Fr Emmanuel’s next stops are Armidale and Tamworth, before taking in Brisbane, Cairns and Lismore. He will then head south to Melbourne, stopping by in Ballarat before moving on to Adelaide and Perth. 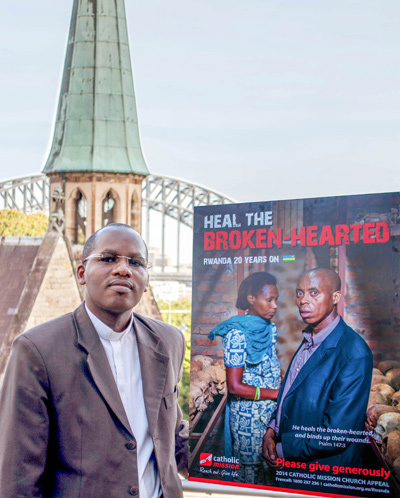 Catholic Mission’s ‘Heal the broken-hearted’ campaign highlights the work of the Catholic Church in Rwanda in helping the people to heal, forgive and unite, twenty years after the genocide. The appeal, featuring in parishes around Australia in the coming months, will raise funds to support the vital work of the Catholic Church in Rwanda, including the building of a new church in Fr Emmanuel’s parish of Nyamata. For further information on the campaign or to make a donation, visit www.catholicmission.org.au/rwanda. To watch the campaign DVD now about Rwanda’s massacre, suffering and healing click: www.catholicmission.org.au/rwandadvd. 9.30-12 noon every 2nd Monday.